Whether you’re a Patriots or a Falcons fan, the culinary highlights of Super Bowl parties are likely to include lots of beer, chips, nacho grandes, hot ‘n spicy this and deep-fried that. It’s always fun to spend some time with friends and enjoy the musical stylings of Lady Gaga while checking out the always-hilarious commercials. But a few tips will help you keep you accountable regarding your nutrition goals. Here, some of my game-night nutrition tricks. Treat Super Bowl Sunday like a regular day; think of the evening’s food offerings as one meal. Don’t go hungry. If you’re a guest, bring salad, crudités, or a high-protein appetizer like chicken skewers or shrimp cocktail to munch on. Once you arrive, start with large glass of water or sparkling water with lemon to hydrate before you dig in. Survey all the food offerings before you begin grazing, then plate all food on a small appetizer-size plate so you know what you are eating. Aim for veggies, guacamole, and hummus. Stay away from fried food and heavy dips. If you can’t live without wings or pigs-in-a-blanket then put two on your plate and add veggies to fill you up. For the main event, after you’ve plated your dinner, sit down and try to be mindful while you eat. Listen to your hunger level. Remember, it’s about the big game and the company, not gorging on unhealthy food. Another healthy dish you can serve or bring that won’t knock you off track? Jessica Seinfeld’s Buffalo Chicken Nuggets recipe, which packs a powerful protein punch that satisfies your savory craving without making you feel like you’ve overindulged. Heat the oven (with the oven rack in the middle) to 450°F. Spray a wire cooling rack with cooking spray and place on a rimmed sheet pan. In a medium bowl, stir together the yogurt, wing sauce, and ¼ teaspoon of the salt. In a large bowl, combine the breadcrumbs, oil, and the remaining ¼ teaspoon salt. Stir until the oil is evenly incorporated. Remove the tenders from the chicken breasts and add to the yogurt mixture. Slice each chicken breast crosswise into ½-inch thick pieces. Add to the yogurt mixture and stir to combine. If you have the time, let them marinate in the refrigerator for 20 minutes. 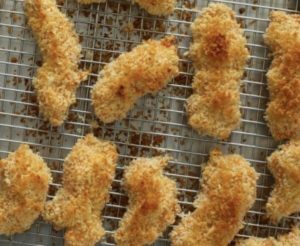 If not, coat each piece of chicken in the breadcrumb mixture and place on the wire rack. Bake the chicken until golden brown, crispy, and cooked throughout, about 15 minutes.